Tag Archive for "low vision" - A resource for people with a vision impairment due to macular degeneration, diabetic retinopathy, glaucoma and other eye conditions. If sending holiday greeting cards is one of your traditions, using a writing guide or template and a flair tipped pen can keep this activity easy and enjoyable. Why not transfer a holiday contact list in an old address book to a new, large print version? This can be a terrific activity for a helpful grandchild.1) If sending holiday greeting cards is one of your traditions, using a writing guide or template and a flair tipped pen can keep this activity easy and enjoyable. Cooking is a time-honored pastime. If favorite recipes are becoming difficult to read, consider re-typing them in large, bold font and preserving them in a large print recipe book. You might also consider sliding each page into a plastic sleeve that can be wiped clean of spills. What a perfect gift for a friend or relative with low vision! Speaking of cooking, when preparing a holiday meal, keep all pot handles turned toward the side of the stove. This will keep them out of the way and prevent unnecessary spills. Lighting your home for the holidays is a fun and important part of the season. Make sure all extension cords are safely out of the way of foot traffic to prevent accidents. When visiting friends and family, why not bring along a flashlight to illuminate dark walkways and entryways? If company visits, ask them to remember to close cabinets, not to leave doors ajar, and to respect home organization. Holiday shopping is a pleasure, but reading small labels on merchandise can be difficult. Bringing along a handheld magnifier can make the experience easier. Going out to eat with friends is fun. Organizing your cash beforehand can reduce confusion when paying your bill. Keep denominations in separate compartments of your wallet or have a system or folding bills for identification. Finally, we all know how busy schedules are this time of year. A large print calendar and a low vision or talking watch will keep you up to speed on all the activities! Using these tips can make for a very happy holiday and a safe and wonderful New Year! Are you concerned about driving as you age? Your eyesight can change as you get older. It might be harder to see people, things, and movement outside your direct line of sight. It may take you longer to read street or traffic signs or even recognize familiar places. At night you may have trouble seeing things clearly. Glare from oncoming headlights or street lights can be a problem. Depending on the time of the day, the sun might be blinding. Low vision eye diseases, such as glaucoma, cataracts, and macular degeneration, as well as some medicines, can also cause vision problems. If you are 65 or older, see your eye doctor at least every 1 to 2 years. Ask if there are any ways to improve your eyesight. Many vision problems can be treated. For instance, cataracts might be removed with surgery. If you need glasses or contact lenses to see far away while driving, make sure your prescription is up-to-date and correct. And always wear them when you are driving. Cut back on night driving or stop driving at night if you have trouble seeing in the dark. Try to avoid driving during sunrise and sunset when the sun can be directly in your line of vision. If you ever feel unsure of yourself behind the wheel, turn in your keys and make an appointment with a low vision specialist who can help you with devices and vision rehabilitation to help you determine your safe driving plan. To find a low vision specialist in your area, click here. How do YOU deal with your low vision? Each person’s story about living with low vision is unique. Some are new to the low vision community, while others have been living with low vision for many years. One of the best ways to come to terms with low vision is to learn how others cope in the real world with visual impairments. 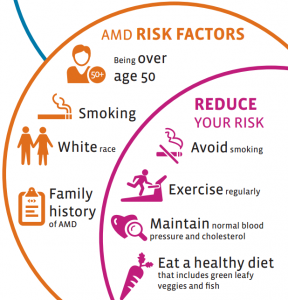 Age-Related Macular Degeneration (AMD) is the number one cause of severe vision loss in U.S. adults over age 60. The devastating condition affects the central vision of as many as 15 million Americans, impairing their ability to see normally and perform many necessary tasks. This February, in observance of National AMD/Low Vision Awareness Month, we encourage Americans over the age of 60 to learn the warning signs of AMD and schedule an annual dilated eye exam. If you or a loved has already been diagnosed with AMD or low vision, check out our section on low vision devices to discover what tools and resources can help support a more independent life. AMD is the gradual but persistent breakdown of the macula, which is the part of the eye that provides sharp, central vision needed for seeing objects clearly. Over time, this deterioration can affect the ability to read, drive, identify faces, watch television, navigate stairs and perform a suite of other daily tasks. For many adults, this visual deterioration occurs in one eye and may eventually form in the other. 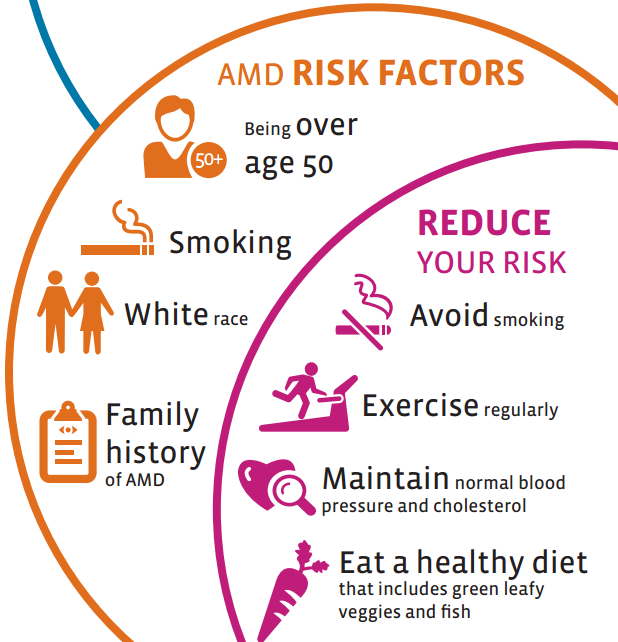 As we observe National AMD/Low Vision Awareness Month, take this opportunity to reduce your risk of developing AMD. Avoid smoking, exercise regularly, maintain normal blood pressure and cholesterol, and eat a healthy diet that includes green leafy vegetables and fish. For extra motivation, find a friend, partner or neighbor to engage in healthy habits with you! If you or a loved one suffers from AMD or vision impairment, what is the best piece of advice you’ve gotten regarding life with low vision? Share with us in the comment section!